Can a Cheat Day Help You Lose Weight? You are here: Home / Weightloss / Can A Cheat Day Help You Lose Weight? According to the Mayo Clinic, “Weight loss comes down to burning more calories than you take in.” With that said you can eat pretty normally and lose weight as long as you burn more calories than you eat. It is a simple equation that comes with practicing restraint and portion control in your daily eating habits. Dieting does not have to include; starvation, eating only one type of food or strict regimens. Drink plenty of water to help flush out fat and toxins after exercise and all day long. You need to be drinking even more than the usual 6 to 8 glasses a day. Aim for about 10 to 12 glasses of water daily. And make sure during exercise you drink an 8 oz. cup of water for every 15 minutes of exercise. Eat your carbohydrates the right way by making sure that you are choosing carbohydrates that are low on the glycemic index. The lower the glycemic index, the bigger portion you can eat. Stock up on protein just like the “high protein” diet experts tell you too. But be sure to add some low glycemic carbohydrates for balance. Go ahead and eat some fats like; olive oil and avocado. These will help to increase brain power while cutting through built up cholesterol in the arteries. Using these tips can help you create your very own diet plan and increase your weight loss. What Makes Diet Plans Effective? The best way to make a diet plan effective is two simple things: Balance and Consistency. Once you start a diet plan you need to carry it out in a balanced fashion and keep doing it! Diets cannot work without a commitment from you. When you come up with a diet plan you need to first set a goal weight for yourself right off the bat. Weigh yourself weekly and use waist measurements to track your progress. Write these down in a journal. (See Figure 2) Stick to your plan and you will see success! It is a known fact that a “cheat day” once weekly can help keep you on track with your diet. As long as the rest of the week you are following your diet plan. This will help keep you from unwanted binges that will pack on the calories that you cut from your diet during the week. Calories tend to run on a weekly budget. If you shave 500 calories a day during the week and eat 2000 extra calories all weekend long, you will blunt your efforts at weight loss. However, an extra 500 calories on Sunday coupled with an extra walk after dinner can help to keep your diet efforts balanced. It may also curb your cravings for the things you cut out over the last 6 days. An easy way to do this is the food exchange system. You technically “bank” some calories and foods for your cheat day. Many popular weight loss systems allow for this way of planning. You get so many “points” or food items that you can eat and bank the rest for later on that day or later in the week. Cheat, but DO NOT BINGE. Use small servings and sit while you eat. 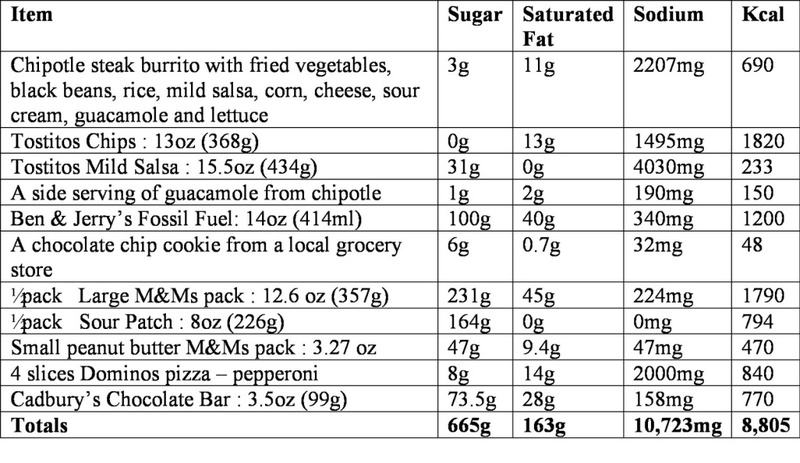 As you can see by Figure 3 above, it would be really easy to “cheat” yourself on cheat day. The biggest importance is choosing foods that will help you eat the foods you crave all week without sabotaging your diet efforts. If you do choose high calorie foods, make sure you eat smaller portions of them and space them out throughout the day. On cheat day, you will still need to keep up your exercise routine to keep your body on track with calorie burning. Most important, continue to drink extra fluids on cheat day. If you find yourself wanting to binge, find something else to occupy your mind. Go for a walk or pick up something to do with your hands and keep yourself busy. If you follow “cheat day” rules, you will find greater success on your diet plan and a newer happier you in the long-run!